UPPCL recruitment is open for recruiting candidates against 3127 vacant Technician, Junior Engineer and Assistant Engineer (Trainee) posts. Interested and eligible candidates can submit their application till 30 October. Uttar Pradesh Power Corporation Limited / UPPCL seeks application from eligible candidates for appointing against 3127 vacancies. 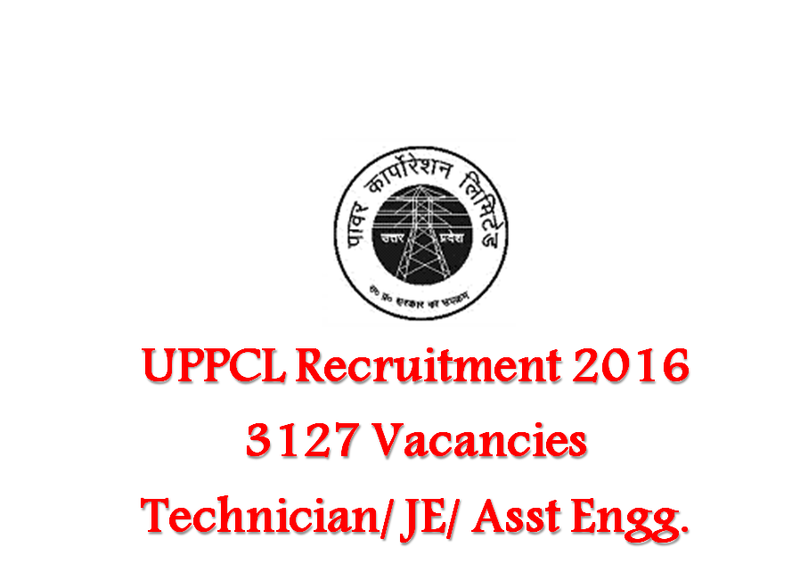 Vacancies notified above are available at UPPCL and Uttar Pradesh Power Transmission Corporation Ltd / UPPTCL as well. Eligible candidates are required to send their application online only. Technician Grade 2 Post: Candidate must have minimum educational qualification of 10th pass in Science & Maths. ITI pass in electrical. Junior Engineer (Trainee): Three years Diploma examination in Electrical Engineering awarded by Pravidhik Shiksha Parishad, Uttar Pradesh OR a Diploma, equivalent thereto, recognized by the State Government OR Three years All India Diploma Examination in Electrical Engineering conducted by the All India Council for Technical Education (AICTE), Govt. of India OR Diploma Examination in Electrical Engineering conducted by any of the Universities in India incorporated by an Act of the Central/State legislature. Candidates should have thorough knowledge of Hindi (Devnagri script),If the candidate has not passed High school or equivalent examination in Hindi, he/she has to clear an exam conducted by the Registrar, Department Examination Govt. Of U.P. within 3 years of joining. Assistant Engineer (Trainee) in E & M Cadre: Candidates should have sufficient knowledge of Hindi in Devnagri Lipi. Degree in the concerned discipline. Assistant Engineer (Trainee) in Civil Cadre: Candidates should have sufficient knowledge of Hindi in Devnagri Lipi. Degree in Civil Engineering. Candidates will be selected on the basis of their performance in written test only. More details in this regard can be found from the link given below. Candidates are required to submit their application online along with the prescribed fees.